This article was written for Profit Magazine and an edited version of it exists here. — Apple CEO Tim Cook’s Letter to users about Maps. Having been in Product Management roles for the better part of two decades now, I am invigorated that there is now active public dialogue about the practice and methodologies. Throw around terms like spint and cycles and MVP during Bubble 1.0 and you got blank stares. Nowadays there are healthy discussions to be had at cafes and bars all over the world about how best to manage and launch major projects. It is into this fray that Apple unfortunately walked with its launch of iOS6 Maps (for iPhone and iPad), simultaneously turfing Google Maps from the default decks of iOS devices globally. I am a big believer (especially within startups) in building to Minimum Viable Product requirements when launching a new product or service, particularly when a number of key market dynamics are unknown to the team building them. As with all methodologies, however, building an MVP and kicking it out into the cold light of day does not and should not apply to every circumstance. The purpose behind an MVP is to make a minimum commitment of resources toward testing a market or hypothesis within a product or service space by building the product which minimally (recursive definition alert!) expressed your Four P‘s (Product, Price, Promotion, Place). You might be inventing something that has never existed before, and therefore wish to ascertain market demand and/or product fit and/or problem fit. You could also be testing positioning that is adjacent to or radically different from a competitor to see whether this causes customers to move away from an incumbent solution. The success of any of these can be gauged by quickly launching a product or service that exists at the crossroads of those four Ps and embodies the basic essence. You might have lofty long-term goals but the key is to make sure that the product meets or exceeds the minimum expression of each of those four Ps. In the case of Apple Maps the ideas of Promotion (tech press covers Apple’s every move), Price (free) and Place (pre-installed on every iOS device) are largely solved for them. The latter issue does, however, get pretty thorny since from a placement standpoint Apple pulled the oft-used Google Maps app to make way for its own. While Google’s Maps app has languished for some time and fallen behind its counterpart app on Android, it worked very well — and bore the benefits of tens of millions of daily users, not to mention the thousands of other applications which leverage the core Google Maps API and thus help to make its data better. This certainly places extra burden on Product. And this is where Apple stumbled. As with prior efforts in this category, including the repeated attempts to get the cloud services model correct such as MobileME and .mac, Apple failed to grasp the complexity of the MVP matrix. In particular, the team at Apple failed to grasp that in pulling an app people touch many times a month and replacing it with another one, one of the MVP requirements was that their app needed to be as good as or possibly better than Google Maps in every appreciable way. That sets a pretty high bar for the “Minimum” in MVP. Apple took an MVP approach with the AppleTV. Early iterations largely flopped, but that was because they hadn’t yet got the technology together to deliver HD video, and were still working out the kinks in their relationships with content producers (moving picture guys were less than enthusiastic about what they saw as Apple undermining the music industry). Steve Jobs referred to the AppleTV as a “hobby” — but what it really was, is an MVP. Apple was slammed, but sold enough of these to seed a marketplace that content providers ultimately wanted to access. The AppleTV grew gradually, but is now likely a permanent fixture in Apple’s product line and may be a harbinger of something far more ambitious. It’s a rare example of Apple testing the waters in a market that it’s unsure about, and launching an inexpensive torpedo into the marketplace in the hopes of scratching out enough of a slice to reach the next stage. Thing is, there are very few markets in which Apple plays that it doesn’t know a lot about, or doesn’t have the ability to learn about without deploying an MVP. In particular, with the Maps app, Apple had access to user data from more than a hundred million users on the iPhone and iPad (and iPod touch!) accessing Maps and were able to gauge with extreme accuracy what was and was not working on the app itself. They also had the opportunity of extraordinarily good data from the thousands of third-party apps leveraging Maps via the SDK. They had literally years of accumulated understanding of the marketplace, the major competitor, the use cases, and the available alternatives. 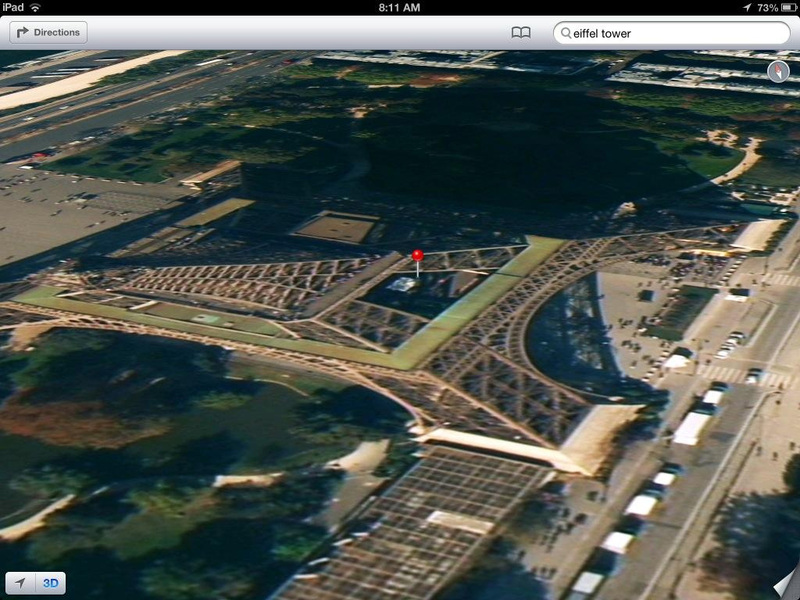 In the case of recreating the Maps app, Apple had nothing substantial to learn. This being the case, relaunching Maps was no place for Apple to employ a Lean, MVP methodology. In this case, the MVP for Maps is the fully-realized Maps app version 2.0 .. and it had better be appreciably better and more functional than what came before. Conceptually, for Apple this was the addition of turn-by-turn directions. That’s a big win, and one users were clamouring for. All other things being equal, Apple would have been good to go. Where the Product element largely flopped, though, was in quality of the data. Flattened objects like the Rug D’Eiffel above, poor placement of objects on the map, incomplete map data (as many have complained about) and wildly inaccurate and out-of-date business listings and addresses all serve as a great weight acting against what otherwise was a step forward. Apple was clearly challenged in sourcing information as good as Google’s (indisputably the best in the world), and had to ink licensing deals with a plethora of companies to get what they needed. In the end, the unhappy merging of these sources is likely the culprit for these problems. As Apple has learned with both Maps and the AppleTV, launching an MVP can tarnish the brand of an established and trusted company, if the product is deemed incomplete or insufficient. In the specific case of Maps, though, Apple tore down something that was good and replaced it with something that was better. In this case there could be no tolerance for deficiencies, and Lean Startup zealots need not have applied. Apple’s brand is about pushing the envelope. Launching a series of marginal MVPs (particularly ones that don’t move the needle) denigrates and lessens this brand significantly. In rare exceptions such as the AppleTV they can get away with this, and the sheer heft of their fan base and audience can overcome weaker products. However this is not a crutch that Apple can lean on repeatedly without impacting their brand halo.